One of the fun parts of telling stories in the tapestry of a shared universe like the Marvel Cinematic Universe is the potential for appearances by other characters who exist in the same fictional space. Some of the best examples of this include Bruce Banner appearing in the post-credits scene of Iron Man 3, Loki appearing as Captain America in Thor: The Dark World, and Steve Lang running into Falcon in Ant-Man. Thor: Ragnarok is already a film with one major guest appearance. Mark Ruffalo will reprise his role as Bruce Banner, the Hulk, to accompany Thor on his cosmic journey. In an Ask Me Anything session on Reddit, Thor: Ragnarok director Taika Waititi revealed another established Marvel Cinematic Universe character he would have liked to include in Marvel movie. “I would have liked to get John C Reilly's character in the film but there was no real way to pull it off,” Waititi said. Reilly played Corpsman Rhomann Dey of the Nova Corps of Xandar in Guardians of the Galaxy. Given the cosmic nature of Thor: Ragnarok’s story, it’s easy enough to see where the Nova Corps might make an appearance, or how Thor and Hulk could visit Xandar, but apparently it just wasn’t that simple. “No, that would make it easy to pull off,” Waititi asserted. It’s unfortunate that we won’t see Dey in Thor: Ragnarok, especially since director James Gunn has said that Dey is also not returning for Guardians of the Galaxy Vol 2. Fans will just have to keep holding out for a proper Nova movie instead. Thor: Ragnarok is directed by Taika Waititi from a screenplay by Stephany Folsom, and stars Chris Hemsworth, Tom Hiddleston, Idris Elba, Anthony Hopkins, Cate Blanchett, Tessa Thompson, Jeff Goldblum, Karl Urban and Mark Ruffalo. 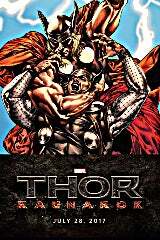 Filming on Thor: Ragnarok began in July 2016 at Village Roadshow Studios in Oxenford, Australia, and is expected to wrap in October. Thor: Ragnarok opens in theaters on Nov. 3, 2017.